As an alternative to selling branded integrated appliances as most of its large competitors do, Veeam partners with as many hardware vendors as possible. Hedvig is the latest Veeam partner, now that the vendors have teamed up to integrate Hedvig’s software-defined storage with Veeam’s data protection. 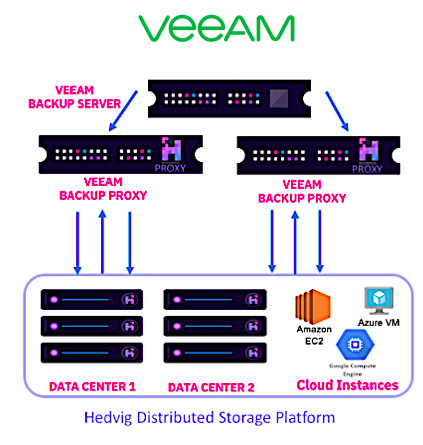 Hedvig Distributed Storage Platform customers can use Hedvig as a backup target for Veeam Backup and Replication software. The Hedvig and Veeam integration enables the vendors to go head-to-head with converged secondary storage startups Rubrik and Cohesity, at one-third of the price, said Angela Restani, Hedvig’s executive vice president of marketing. “With Hedvig, [Veeam] can provide a complete solution,” Restani said. Other competing integrated backup appliances include Veritas NetBackup, Dell EMC Integrated Data Protection Appliance and Commvault HyperScale. Hedvig storage can be integrated into an existing Veeam workflow using any Linux or Windows-based Veeam Repository servers. The Hedvig cluster can be configured according to the customer’s backup target needs. Hedvig provides storage capacity configurations from 24 TB, 48 TB and 96 TB, along with different disk types such as HDD and SSD. Customers can also install into public clouds such as Amazon Web Services, Microsoft Azure and Google Cloud Platform. The Veeam integration enables the creation of scalable, pay-as-you-grow backup storage. “Hedvig’s software-defined storage capabilities and enterprise focus make them an ideal addition to our [partner] program,” Ken Ringdahl, Veeam’s vice president of global alliance architecture, wrote in an email. Veeam recently laid the groundwork for its new “hyper-availability” platform strategy that includes backup, aggregation, visibility of data, orchestration and automation. That platform, Ringdahl said, helps enterprises evolve data management from policy-based to behavior-based and ensure workloads are available across any application or cloud infrastructure. The Hedvig Distributed Storage Platform allows businesses to create an elastic storage system built from commodity server hardware to support any application, hypervisor, container or cloud. The vendors have certified Veeam Backup and Replication 9.5 and above, and Hedvig Distributed Storage Platform 3.0 and above to work together. Veeam has partnerships ranging from reseller deals to product validations with storage vendors NetApp, Hewlett Packard Enterprise, Pure Storage, Dell EMC, Cisco and others. This is Hedvig’s first partnership with Veeam, said Gaurav Yadav, Hedvig product manager. Hedvig is eyeing a deeper Veeam integration, for example in using Veeam’s recently released Universal Storage API. Pure Storage recently teamed up with Veeam on an integration initiated through the API. Hedvig launched an integration with NetBackup last year, Yadav said.